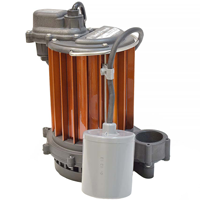 We offer a large selection of submersible sump pumps from leading manufacturers including Little Giant and Liberty Pumps. 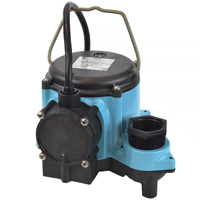 Available models include manual and automatic sump pumps with various switch types, head & flow parameters, cord lengths, voltages and housing options. 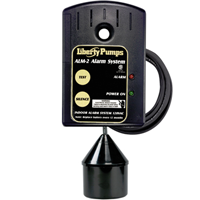 Liberty automatic & manual sump pumps for residential, commercial and industrial applications. Automatic and manual sump pumps by Little Giant for residential and commercial use. Manual and automatic submersible sump pumps with diaphragm, wide angle, and vertical mechanical switches and various cord lengths. 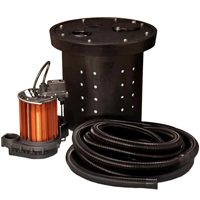 Sump pump and basin kits (perforated and non-perforated) for crawl space and basement applications. Liberty Pumps battery powered and water powered sump pump backup pumps, batteries and pump systems. Liberty 404 & 405 series, Little Giant Drainosaur and SaniFlo SaniSWIFT, SaniSHOWER and SaniVITE drain pumps. Sump pumps for high-temperature applications, including boiler rooms, transformer vaults and steam cleaning pits. 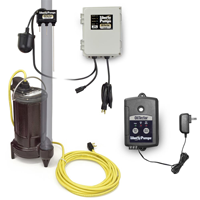 Sump pumps and oil sensing controls for installation in elevator sump pits, including Liberty Pump OilTector system. Indoor and outdoor high level alarms, simplex and duplex controls for residential and commercial applications. Check valves, extension hoses, adapters, replacement cords and flow switches for Little Giant and Liberty sump pumps. Sump pump is a submersible type pump installed in a sump basin below the foundation of the house, most commonly in a basement. Its purpose is to remove the excess rain and groundwater which accumulates under the foundation to avoid flooding. Most sump pumps are designed only for handling of relatively clean water with solids size not exceeding typical sand and occasional small pebbles. The primary difference between all sump pumps are their modes of operations explained below. A manual sump pump is activated and de-activated by manually plugging the power cord plug into an electrical outlet. This type is most commonly used for manual dewatering of basements, pools and similar applications. They are not common for use in sump basins, however, when coupled with a piggyback switch, may allow for automatic operation. 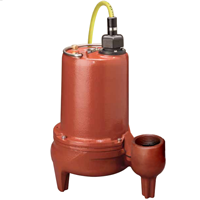 An automatic submersible sump pump includes a float or a switch which activates or de-activates the pump when water level reaches factory pre-set threshold. All sump pump switches can be divided into regular (integral, built-in, wired directly to, etc.) and piggyback switches. The later are not wired directly into the pump and have a separate receptacle+plug combination instead of the typical plug. This piggyback type connector plugs into the electrical outlet first, while the sump pump itself is plugged into the piggyback outlet. This option allows to run the sump pump in automatic mode. When piggyback switch is bypassed (not used) and pump is plugged directly into the electrical outlet, it runs in manual mode and can be used for manual dewatering and applications described above. Vertical Mechanical Float - plastic or foam float which moves on a shaft parallel to the sump pump and is best for narrow basins or where the space is limited. 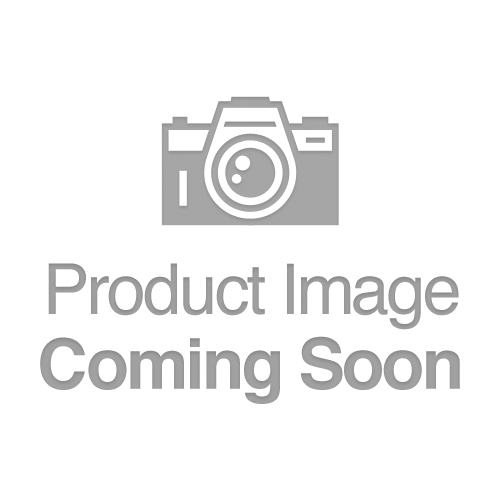 Wide Angle Float - most commonly a hollow cylindrical float made from hard plastic with mechanical switch inside, attached to the sump pump by own power cord. It requires more space in order for the float to move freely, but is also less effected by floating debris then all other switch types. Diaphragm Switch - electrical switch which detects water and activates and deactivates the pump accordingly. Switch or float regulates when to activate and deactivate the sump pump and each automatic sump pump has factory pre-set ON and OFF levels. “ON” level indicates the water level at which the pump activates, while “OFF” level indicates the level at which the pump turns off. For diaphragm switch models, this level is non-adjustable. 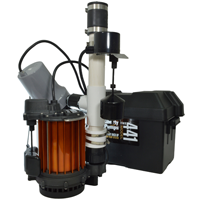 For vertical float sump pumps, only the OFF level can be adjusted on select models. Models with wide angle float typically allow for adjusting both levels by increasing or decreasing the unsecured portion of the cord with the float. Water Powered Sump Pump - installs as and addition to the existing electrically-powered sump pump to remove the sump water in the event of power outages. These pumps are powered by the municipal water pressure. 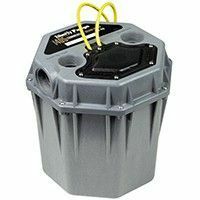 Sump Pump Battery Backup System - an external high-capacity 12V battery with control used to provide electricity to the pump during power outages. 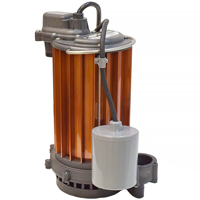 Select models also include a secondary backup sump pump as well. Most of the residential models are 115V with few 230V exceptions and include a standard electrical plug. Voltage over 115V is typical only for larger horse-power pumps used in commercial, industrial and institutional settings. Select models must be hardwired. Power cord length is an important factor since submersible sump pump must be plugged directly into the receptacle without using an extension cord. This safety measure is designated to protect against short circuits and electrical shocks. Most common lengths of the power cord are 10ft and 25ft, which is adequate for most installations. Select models have a 35ft or even a 50ft cord. Housing is the material of which the outer body of the sump pump is made of. Cast iron housing is by far the most used and widely available for cost reasons. Aluminum housing costs more, but has better heat dissipation properties and offers better protection of the motor against overheating. Each pump has a characteristic known as “pump curve”, which indicates how much water (in GPM) the pump can discharge at a given height (ft of head). This chart should be consulted carefully when selecting a sump pump, since it is important for the pump to keep up with the rate of rising water table during rain or flooding.